WDotW Returns! A great full team rush/oz play drill courtesy of one of the two Laker programs in NCAA D1. 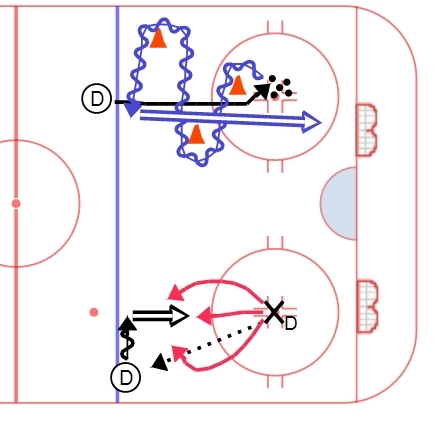 The drill starts with F1s crossing and exchanging a puck near the top of the circles. Two D start at the blueline and play the rush 2v2 back into the zone. Once in zone, two D (D2) come and play the offensive points while F1s and D1s play 2v2 below the tops of the circles. 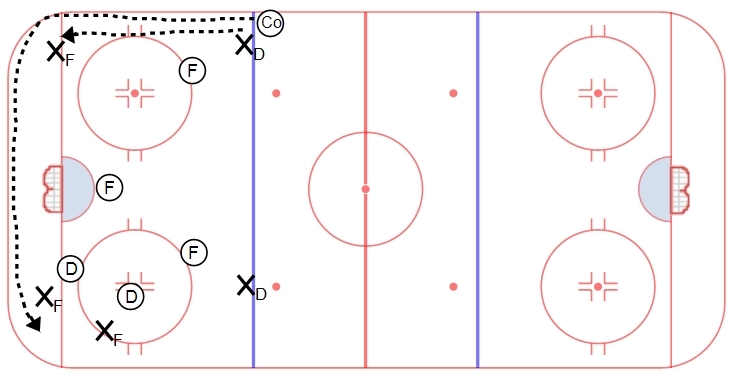 F1 can use D2 at the offensive blue line to maintain possession and generate point shots. On the whistle, F2’s cross and exchange a puck, attacking D2 down the ice into the far zone 2v2 – two D1’s join to play offensive points. The drill is then continuous, with the next pair beginning their attack on the whistle. Every sport has different lineup policies – some dress everyone and only some people play (football, basketball, baseball) and others only dress a certain number but most (if not all) participate (hockey). Each of these sports have players that are regulars in the lineup and contribute every night. They also have players that are on the fringe, maybe getting a few plays a game to make a difference. Players who are securely in the lineup every night face a certain type of pressure. They are expected to produce and play at a high level every night. Players on the fringe experience a very different type of pressure. Fringe players have the pressure of having to do well in limited minutes or lose their opportunity to play. Who struggles more with the pressure? I would argue that fringe players have a harder time with the consistent lineup pressure than those playing every night. Any high level athlete has the word “player” as a major part of their self identity. Being in and out of the lineup with limited minutes creates a situation where you are no longer a “player” but someone who sits on the bench. This creates an internal identity crisis for the player – are they good enough to be who they thought they were in their mind? When these players get in the lineup, they often play “to stay in the lineup” vs “playing to win” – they make safe plays and play in a way that shows they are scared to make a mistake. So how do you handle the pressure, how do you seize your opportunity when you are given a chance to play? Daily attention to detail. If you’re a fringe player, your practices must become your games. Your attention to detail must be near-perfect. Every repetition you get must be done as well as you can do it. You have to be brilliant at the basics of the game. In hockey, this means finishing your checks, picking up on the backcheck, executing systems with precision, going hard to the net, winning puck battles, etc. You have to do all the little things every single day and hold yourself accountable to those details. Ask yourself – did I do the absolute best that I can today? These details should be ingrained in every player anyways, but they are especially important for players who are on the bubble. Doing all the little things and executing the details with pride will not only earn you playing time but it will also help you seize your opportunity for success. When you do get into a game, your habits (systems, checks, backchecks, battles, etc) will create opportunities for you and your linemates and keep you in the game on a regular basis. If the easy things aren’t executed, it becomes easy for the coaching staff to take you out of the lineup again. While this addresses players who are on the fringe, the reality is that this is the key to success at any level and for any activity. Being persistent at the details – never letting little things slide. Preparing and practicing like you want to perform will make your performance a habit. People get nervous for games, performances, presentations, speeches, etc when in reality, all these big “events” are is adding an audience to what you do on a daily basis. If you execute the details daily, you will do them in performance. Nerves come from not being confident in your ability to perform – confidence comes from preparation. Prepare like every day is a performance and you will see your success grow.